LocostUSA.com • View topic - Tilt front end hardware. Post subject: Tilt front end hardware. I am at the point where I have to attach the one piece nose bonnet to the chassis. My nose at the lowest point is at least a foot farther ahead of the chassis and I would like it to be easily removed from the car as well as just tilted.. I am sure I can come up with something fairly simple but thought I would ask to see if any one has done this already and save some design time. Attached is a pic of the nose /bonnet The farthest chassis rail is horizontal right at the bottom vertical part of the nose. 1/2 square tube perimeter rivetted and glued to the skin, for mounting the hidden hinges (look like a large "D") and a standard remote hood latch at the front, engaging a loop of solid 1/4-3/8 rod (same od as the latch donor's hood). It should be a full loop so the hood cannot fly open on your way home from the mall because you were lightly tagged in the parking lot, bending the mount. 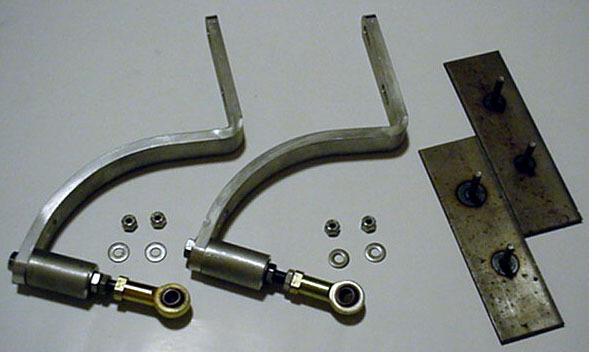 The D hinges can use quick release pins as hinge pins. Here are a couple of pics of the way I did my hood/nose hinge. It works great. It holds the nose when the hood is down, but lift the hood vertical and you can lift the hood/nose clear of the chassis. MUCH easier to use than normal hinges, or even hinges with removable pins. I like both ideas and the simplicity of the last. I think I would be worried of the second one coming loose some how at speed. Some nice chrome hood pins fore and aft would ease the worry though. bolted the other end to the inside of the nose (two 1/4" pan head screws per side) and let the hood hold the nose down. Oh well, it passes the 50/50 test*. PS: MiataV8, what's a D hinge? *It looks good at 50 mph from 50 feet away. A hidden hinge looks sort of like a D from the side. I think I would be worried of the second one coming loose some how at speed. It's not obvious in the photos, but when the hood/nose is down, it can't slide back so the hooks can't possibly slide off. The hood has to be up to get the clearance to slide the hooks off the pins. I have latches to put on the sides to keep the hood down (though it seems to stay down just fine on its own) so once it's down, it's not going anywhere. I like your design John. I would just turn the hook around the other way on the opposite side so a remote latch is not the main thing keeping the hood from sliding rearward. Then the hood would have to tilt to the left or right to unhook one side at a time. If it is a pin latch, I'm sure it can't go anywhere as-is. Thank you. I hope others can take advantage of it. If one of the hooks were turned around, it would keep the hood/nose from sliding off when it's vertical. And that has been a really handy feature. The thing that keeps it from sliding backward though isn't the latch, it's the LC corners. The nose part comes up snug against the front of it when it's lowered. And even without that, the gap between the rear hood edge and the scuttle is only about an 1/8", not near enough to let the hooks loose. Here is another photo to show what I mean. This was taken while I was still doing the final trimming and placing the hardware. Now there is virtually no gap between the edge of the hood and the LC member when the hood is down. By the way, is there any standard name for a combination nose/hood? I've been trying to decide if it is a "Hose" or a "Nood". Suggestions? File comment: Fitting and trimming the hood/nose. Locost_Johnh, had to shrink those pictures down, even at 1/2 size they're still big. Yeah, I seem to be photo challenged. Sometimes I get it right, and then I forget how it worked. Sometimes I wonder if I should have been a mechanical engineer instead of electronic. can't take advantage of the usual line-fitting feature of this site. I know there are times when extreme detail is needed, put pic sizing as appropriate makes this all an easier read. I think my nose might end up a little longer than usual, which would mean hinging like some of the ones here would not work, as I'd only get maybe a 45 degree angle before hitting the top of the nose on the ground. Perhaps some sort of hinge that raises it a little would work... I'm thinking of my buddy's 78 mulletmobile... er... firebird... it has slightly complex hood hinges that raise it while opening it.... hard to explain.